One of the distinctions between the rational and irrational part of God’s creatures is, that while the latter are clothed by his wisdom, in the manner best suited to their mode of life, the former are left to their own guidance in what relates to the covering of the body. It would seem that the gift of reason was intended to be a sufficient guide in the matter; and all sorts of materials being furnished by the bounty of Providence, and their various properties and modes of adaptation being beautifully exhibited in the clothing of animals, human beings were expected to exercise their reason and their ingenuity in turning these things to the best account. As far as ingenuity goes, man has certainly fulfilled his destiny; the endless variety of fabrics for covering the body, and the diversity of shapes in which they are made up, show that his fertility of invention is fully equal to the task devolved upon him. Whether his reason is as successfully employed in adapting his clothing to the necessities of his body, may be questioned, as long as we see people crippled by tight shoes and boots, rendered stiff-necked by high and hard stocks, and youthful forms distorted, and the animal functions necessary to life and health impeded, by tight lacing. In no way has civilized man played more fantastic tricks, and sacrificed his reason more entirely to folly, than in the matter of dress. 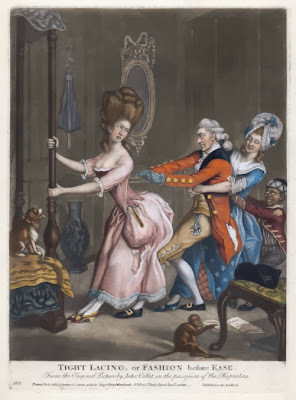 The clumsy and inconvenient garments of the savage are attributed to his ignorance of domestic arts; but what can be said in excuse for civilized man, when he wears shoes that project half a yard beyond his feet, or exchanges his own locks for an enormous periwig, filled with powder and pomatum; when the graceful motion of a lady’s head is sacrificed to the stiff movements necessary in balancing a tower of linen and wire, half a yard high, with draperies that flow from the top of it to the floor; when the wavy lines of a female form are disguised under a stiff circle of whalebone, which imprisons the body from the hips upwards, and a buckram cage so surrounds the lower limbs, that she can with difficulty walk or sit. Some false standard of beauty, invented perhaps to conceal deformity, is set up, and then the very bones and muscles of the perfect body must be made to conform to it. When this is carried so far as it is in the case of small feet in China, its absurdity strikes us at once; but we may find nearer home instances of a standard as false, and even more fatal to health and happiness, than the little feet of the Chinese. The history of national costume in the civilized countries of Europe shows, that for many centuries the progress of art and manufactures only led to greater extravagances in dress, and more preposterous fashions. One enormity was only displaced to make way for its opposite extreme, as in the case of the peaked-toed shoes already mentioned; these were followed by shoes of only the length of the foot, but as broad as they were long. At one time men’s coats were so short that they resembled boys’ jackets of the present day; and soon after they were so long and full, that they looked like female attire. Women’s sleeves were sometimes made so long, that they were tied in knots, to prevent the wearer from treading on them; nine yards of cloth being a moderate quantity for each sleeve; then they were made quite tight, and reached no farther than the elbow. It would seem, that for centuries the ingenuity of nations was taxed to invent monstrous forms of clothing, as well as inconvenient and useless appendages, and that comfort and ease were the things most of all avoided in dress. About the middle of the sixteenth century, stuff stays and hoops were first introduced into England; and though nothing could be more uncomfortable to the feelings, or a greater outrage upon taste and nature, they continued in fashion, except for a short period during the reign of Charles the Second, nearly two hundred years. The hoop often changed its shape and size, but was never discarded till some time after the accession of George the Third; and, as the fashion of court dresses is fixed at the commencement of a reign, and continues unchanged to its close, the long reign of that monarch caused the modes of 1760 to be witnessed in the beginning of the nineteenth century. I have seen the ladies going to a drawing-room at St. James’s palace, dressed in enormous hoop-petticoats, and have heard them say that it required great practice to move in them with any grace. These hoops were constructed of whalebone and millinet, of an oval shape, the length of the oval being across the figure from hip to hip, and of the same size at top as at bottom. That part which extended beyond the waist on either side was rounded off, and covered with ribs of whalebone and millinet, leaving a hole in the middle, through which came the living puppet that was to carry this load. When the waists were worn short, the hoop was lifted up till it interfered sadly with the elbows, and obliged the wearer to carry her arms in a very constrained attitude before it. Over such a machine were displayed the rich materials of the court-dress. Looking upon this grotesque contrivance, after the general fashion of hoops had passed away, and when they were gazed at on gala days, as a raree-show, it was difficult to imagine rational beings reconciled to them, and considering them an indispensable part of female attire, or to believe that they were once so universal in London, that maid-servants were seen washing down the door-steps in hoop-petticoats! Yet such was actually the case, before they were left off by the higher classes. The knowledge of these past fashions should make us look with jealous eyes on those which prevail in our day, in order to discover whether we are not in the practice of something which will appear equally absurd to future generations. The French nation has long been the arbiter of fashion for most civilized countries, and the political revolution of the last century was accompanied by a revolution in dress, almost as signal; for it banished wigs and buckles, powder and pomatum, stiff stays and full petticoats, long waists and high-heeled shoes. One extreme led to another; and the ladies who had been encased in whalebone, buckram, and abundance of quilted petticoats, stepped forth as Grecian goddesses, without any corsets, any petticoats, any fulness to their garments, or any heels to their shoes. White muslin dresses of the scantiest dimensions, drawn closely round the figure, with the shortest possible waists, and not a fold or a plait that could form any drapery, were the order of the day in France, and quickly spread into England and America. Look at the portraits of females painted twenty-five or thirty years ago, as in the historical pictures of that period, such, for instance, as the coronation of Napoleon, and the tight sleeves, short waists, and narrow skirts of the women appear so unnatural, that it will be difficult to believe that such a style of dress ever looked well. I remember when full-grown women wore dresses only a yard and a half wide at the bottom, and sloped away at top to the size of the waist, so that it was difficult for a lady to step across a gutter, or into a carriage. The belt, too, was passed across the bosom, so as to press very injuriously upon it, and actually rode upon the shoulder-blades behind. The old ladies of that day, who remembered with partiality the flowing draperies and full petticoats they had worn in youth, used to groan over their degenerate daughters, and say that their scanty dresses made them look as if they were stuffed into bolster-cases. Now that both these fashions have passed away, we can form an impartial judgment of each, as we see them in pictures; and certainly, with the exception of the hoop, the fashions before the French revolution were more dignified, decorous, and graceful, than those which immediately succeeded it. Those of the present day appear to me to hit the happy medium between both, and to unite the best part of each. If our ladies would cease to compress the waist as much as they now do, they need not fear the criticisms of posterity. The influence of fashion is so strong in corrupting the eye, and perverting the taste, that it has led some persons to doubt the existence of any true standard of beauty, as applicable to costume; but as long as some forms of dress, when out of fashion, look better to us than others, we may fairly conclude that there are some immutable principles of taste connected with the subject, and that those articles which we admire after they have ceased to be the reigning mode, conform in some degree to true taste. Such, for instance is the simple cap, called after the most beautiful and most unfortunate of queens. When the prevailing fashions are most opposed to the shape of the Mary-Queen-of-Scots cap, it still appears to us beautiful; and when adopted by a modern lady, as her costume in a portrait, or her dress at a masquerade ball, it is pronounced highly becoming. Now this is not the case with the monstrous constructions of gauze, ribbon, and wire, that were called caps fifty years ago; nor with any of those head-dresses which outrage common sense, and set all proportion at defiance. As soon as the enormous horse-hair cushions, over which the locks were combed and plastered with powder and pomatum, went out of fashion, that style of head-dress was condemned as hideous. The occasional triumph of good taste over fashion, is shown by the frequent return of pretty shapes into fashion. Every few years the Scottish queen’s cap is brought into vogue; and, were it not for the insatiable love of novelty, it would never be wholly laid aside. The surplice waist and Grecian bodice have an inherent beauty in them, which has caused their frequent revival, and has now kept them in fashion for several years. Now, if the principles of true taste are involved in the mysteries of a lady’s toilet, is not the study of them worthy of a refined and intellectual being? and would not her time and thoughts be better spent in conforming her style of dress to them, than in eagerly following every change of the mode, dictated by the love of novelty, apart from real beauty? I do not mean by this, to recommend singularity of dress, and a wide departure from the prevailing mode; singularity is to be avoided, and she is best dressed whose costume presents an agreeable whole, without anything that can be remarked. Dr. Johnson once praised a lady’s appearance by saying, she was so perfectly well dressed, he could not recollect anything she wore. I would have young people of cultivated minds look at everything with an eye of taste, and, judging of the merits of a certain form of garment apart from the charm of fashion, so modify their compliance with the reigning mode as not to sacrifice to it their sense of beauty. Mere fashion should never be allowed to triumph over common sense or good taste, but be kept in check by both. […] A pure taste in dress may be gratified at a small expense; for it does not depend on the costliness of the materials employed, but on the just proportions observed in the forms, and an harmonious arrangement of colours.